Polyaniline (PANI) was synthesized in Emaraldine form by in situ chemical oxidation method by using Ammonium perdisulphate as oxidizing agent. The XRD pattern indicates that PANI is a semi crystalline solid with d-spacing 4.801 and 4.358 Ǻ. The SEM results show that the particle size lies as an average of 80 nm and length 550 nm. Similarly the UV-Visible spectra of this polymer indicate two absorption bands at around 320 nm and 640 nm. These absorption bands are attributed to the transitions of π → π* and Benzenoid to Quinoid respectively. The FT-IR spectrum of PANI shows strong bands at 3,442, 2,925, 1,598, 1,494, 1,453, 1,176, 1,112 and 744 cm−1 respectively. 1H NMR spectrum shows 6 peaks with chemical shifts δ = 7.452, 7.468, 7.505, 7.525, 7.604, 7.638 ppm. The lower three peaks at (δ = 7.452, 7.468, 7.505 ppm) are attributed to the protons related to the 14N nucleus. These spectral lines intensity ratio lies as 1:1:1. Another three peaks at (δ = 7.525, 7.604, 7.638 ppm) are attributed to the three protons, which are present at CH Benzenoid, NH, CH at Quinoid. The intensity ratio of these spectral lines is 1:2:1. The room temperature ESR spectrum of PANI Emeraldine salt shows an unresolved peak with lande’s g factor 2.010 due to polarons. 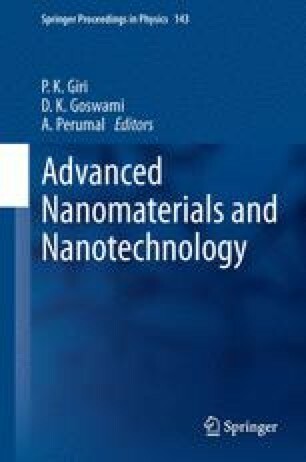 The authors are thankful to the Head Department of Physics, Osmania University, Hyderabad, India for providing laboratory facilities.